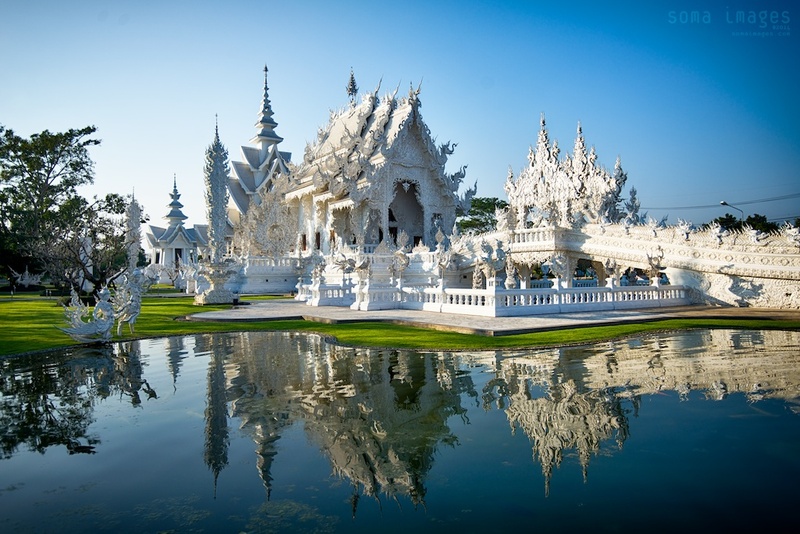 Wat Rong Khun, or the White Temple as most foreigners refer to it, is an unconventional Buddhist temple in the Northern province of Chiang Rai, Thailand. 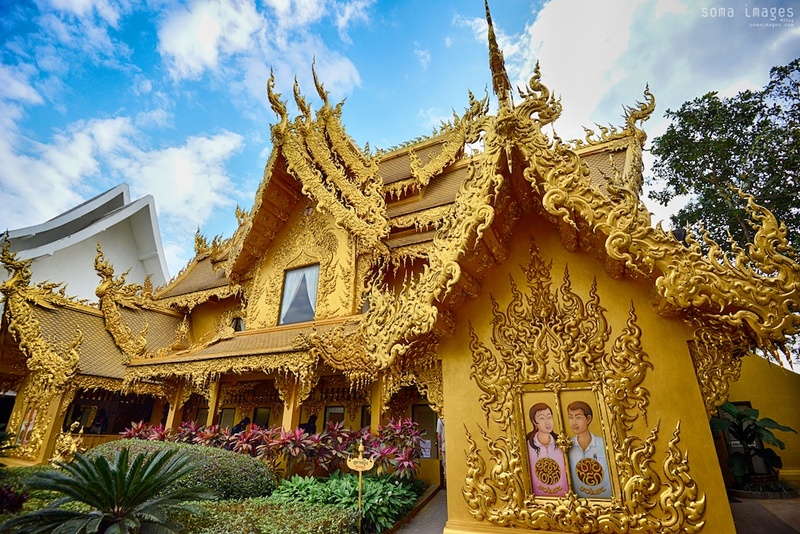 Designed in 1997 by famous Thai painter-turned-architect Chalermchai Kositpipat, this fantastical temple is a magnificent blend of traditional Thai architecture and the surreal. 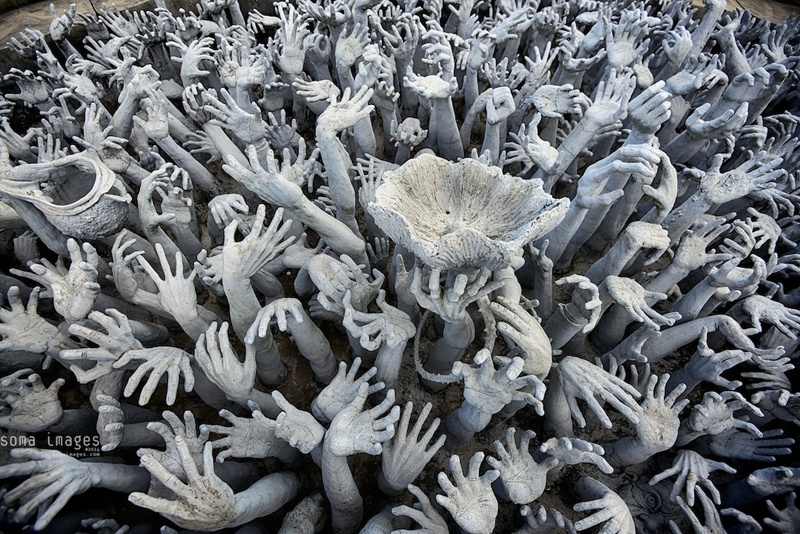 Although Thailand has many Buddhist temples, no other temple is quite as unique as Wat Rong Khun. The main temple itself, Phra Ubosot, is painted white to symbolize Buddha’s purity. 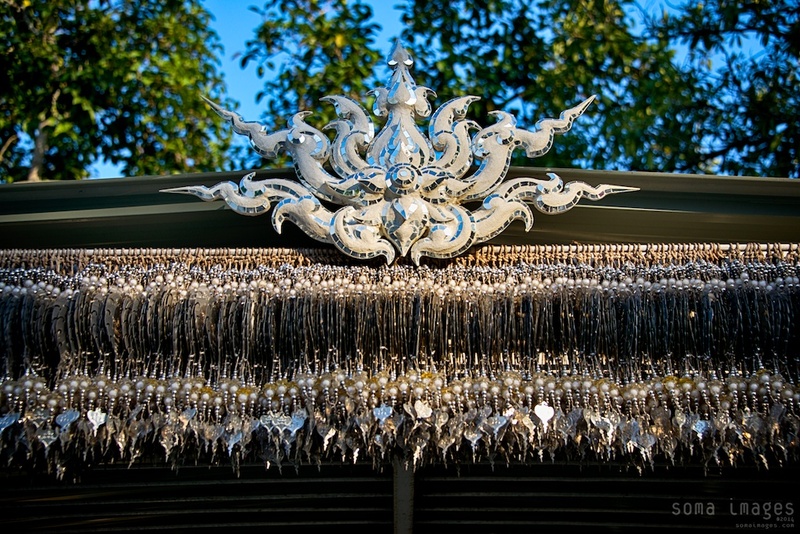 It is an ornate, glistening silver structure, covered in a mosaic of mirrors which sparkle in the sun. To get to the temple, visitors must first cross a bridge over a sea of outstretched hands, which symbolize desire. Inside the temple, the walls are covered with detailed murals. 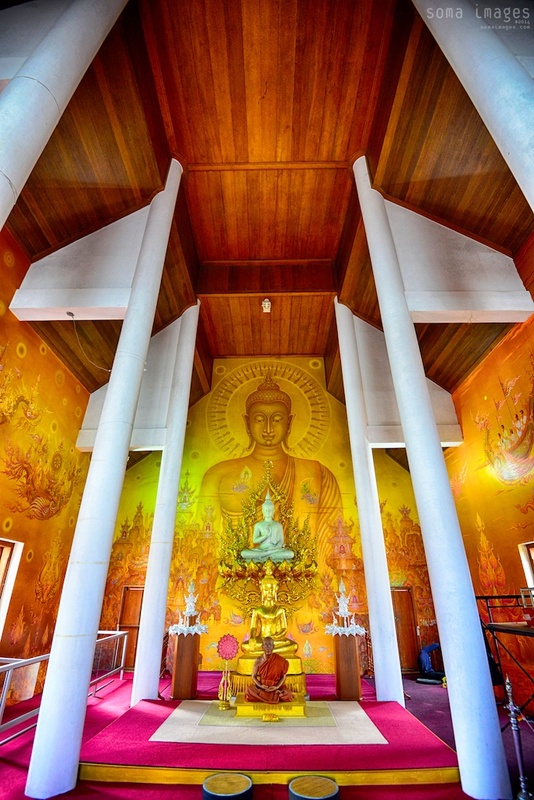 In the center focus of the temple, a large image of Buddha is painted behind a lifelike wax statue of a famous monk. The opposite wall features a giant, detailed mural consisting of contemporary scenes and icons of popular culture. Instead of paintings of heroes fighting demons, Kositpipat decided to take contemporary manifestations of good and evil and put them into a Buddhist context. Images of Batman, Superman, Predator and even Keanu Reeves as Neo from The Matrix are seen in the mural. Look closely and you will also find Freddy Krueger of Nightmare on Elm Street fame, Pinhead from the Hellraiser movies, Japanese manga star Doraemon, and even one of the giant robots from The Transformers. While including such figures in a temple might seem shocking or strange, when you are actually in the temple, all you can do is marvel in amazement at the level of design, artistic talent, and vision that was put into both the temple itself, and it’s murals which cover the inside walls. The inclusion of these pop culture icons and the detailed, intricate artwork are some of the differences that make Wat Rong Khun unique among a nearly endless number of temples built using standard color schemes and design. Kositpipat had creative flexibility, and an opportunity to not only express his vision, but also create a thing of beauty. There is also an area where visitors can inscribe a prayer or message on a metallic chime, which will then be built into structures on the temple grounds. One area featured a pathway with a sea of chimes serving as a beautiful roof. Another had an ornate towering tree compromised of thousands of glistening chimes. Admission is free. There is also a museum on-site which houses many of Kositpipat’s original works. The museum unto itself is worth a visit. 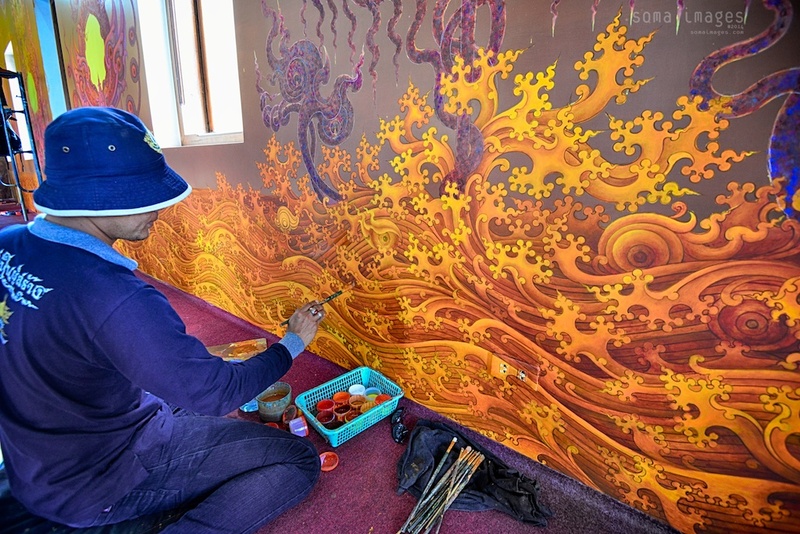 Kositpipat has a unique, refined style, which can even be very psychedelic at times. The museum showcases how his style has changed over time, and also features some of his bronze sculptures, which are exquisite. There is a reason why Kositpipat is so well regarded in Thailand! Unlike any other temple in South East Asia, Wat Rong Khun is a must-visit destination if in Chiang Rai or visiting Northern Thailand. The temple and it’s grounds are truly a visual spectacle. Not only beautiful, but also a unique, artistic creation. Visiting the complex is a treat to the senses, and a journey through an artist’s vision.